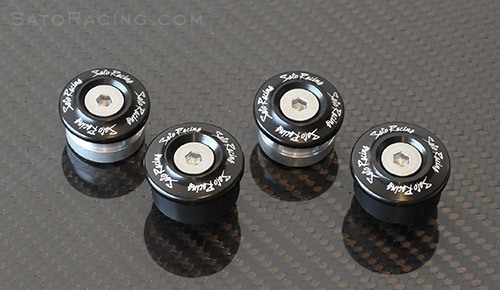 Sato Racing Frame Plugs for 2012-2014 Ducati 1199 Panigale/S* offer a stylish way to hide the exposed lower frame holes, and the set includes matching plugs to fill the upper holes. Made of anodized billet aluminum, with expandable inserts to keep them firmly held in place. Choice of Black, Silver or Gold. 4-Piece Set (2 Frame Plugs per side). * NOTE: Not compatible with 1199 R.